Did you spend $10 on a Rubik's Cube and want to solve it? 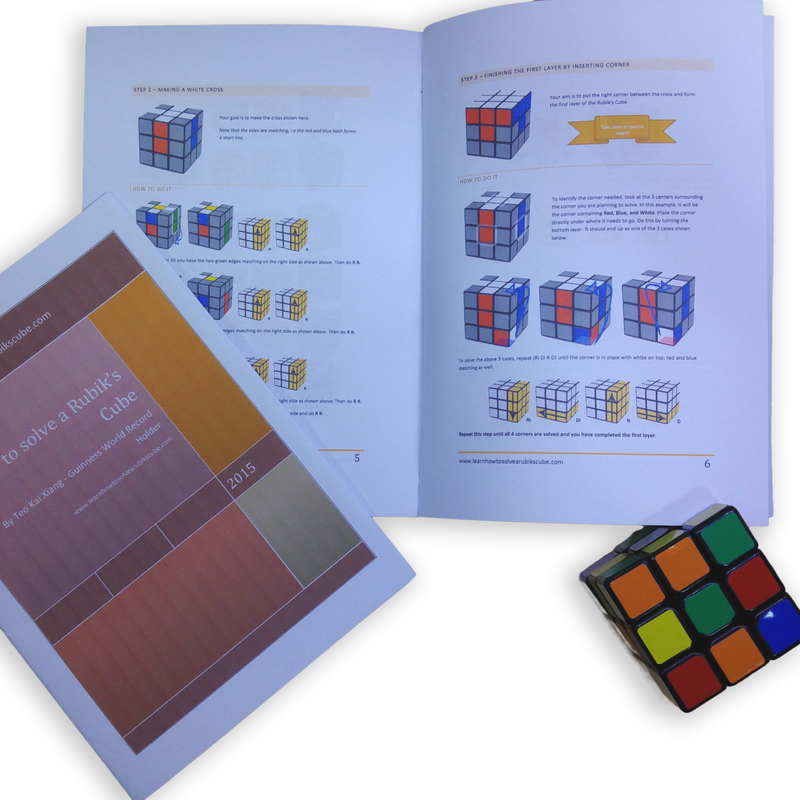 Want to learn how to solve the Rubik's Cube but prefer to read things in a physical format? Want your child to learn the Rubik's Cube without the distraction of an internet connected device? Don't want to spend $40 on one hour of Rubik's Cube training? In this guide, you will find the step by step solution to solving the Rubik's Cube. It is designed to be printer friendly and can be made into a booklet. This is the exact guide that I use in my Rubik's Cube lessons that I charge $40/hr. I have used it to teach children as young as 5. My 6 years old student can now solve the cube in 1 min 44 seconds. Clearly illustrated, every move required is pictorially shown. You no longer need to learn confusing notations found in most solution guide. Kai Xiang learnt to solve the Rubik’s Cube 9 years ago in 2007 when he was twelve. He has been competing since 2008 and has broken 81 Singapore National Records since then. In 2010, he ranked 4th in Asia and 9th in the world for the 4x4x4 Rubik’s Cube. In 2011, he held 25 national records simultaneously. Kai Xiang also set the Guinness World Record for “Fastest time to solve a Rubik’s Cube whilst juggling” in 2015. He has been featured on television shows, newspapers, magazines and radios for his achievements several times. Kai Xiang taught over 10 thousand students through his website and taught children as young as 5 through his teaching engagements. Kai Xiang is currently a joint university scholarship recipient for a double degree program in engineering and business management. He also scored 7 distinctions for both his GCE ‘O’ and ‘A’ level examinations. Nicholas is currently an undergraduate in Piano Performance at the Jacobs School of Music, at Indiana University. Nicholas graduated from the NUS High School of Mathematics and Science with a Diploma (Distinction), with Honours in Physics and Mathematics, and Majors in Chemistry and Music. During his time at NUS High School, Nicholas’ team won the coveted Gold Award at the 2011 Singapore Science at Engineering Fair, with the project “Designing Rubik’s Cube Mechanisms”. Nicholas first learnt how to solve the Rubik’s Cube in 2005, and picked up speedcubing as a serious hobby in 2007. He developed Sandwich, an alternative, direct solving method for big cubes (for 4x4x4 and above). While not as fast as regular, conventional methods, Nicholas has achieved respectable times with Sandwich, through many hours of optimizing and improving the method. He held 2 National Records for the 2x2x2 in 2010. Nicholas also coached many speedcubers in Singapore during his active speedcubing years, helping them improve their timings, with the insight he had through developing alternative methods. His best student is Kai Xiang, who broke the sub-10 seconds barrier in 2010.